Create a unique family tree design. There are probably as many different types of designs of family trees as there are unique individuals to create them. 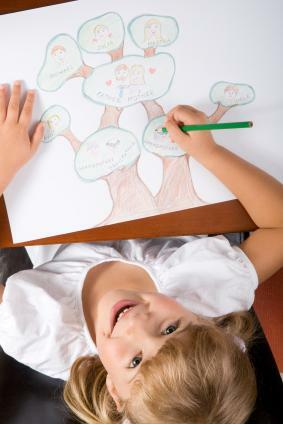 From custom paintings to cartoon styles for children, the family tree designs may range from very simple to very elaborate. You might hire an artist to create a work of art, although this is probably the most expensive route. You may hire a genealogist to create your family tree for you using professional genealogy software. Buy genealogy software for your home PC. There are free and paid versions of genealogy software that come with a range of family tree template designs. Utilize downloadable templates. Some of these are free, and some are paid versions. Make use of free online genealogy website tools. Pic Search allows you to view many different designs of family trees in pictures. The Tree Maker offers family coat of arms / crests, surname histories and mottos in addition to a variety of family tree designs. Designs by Margo offers professional art work. Free Printable Family Tree Diagrams provides designs for basic family tree diagrams with a photograph of a tree in the background. Family Tree offers software that allows you to personalize your family tree diagram. My Family Tree is a craft for kids. Apples on the tree diagram are filled in with names of family members. When you have narrowed your search for designs of family trees, all that remains is to supply the information to fill in each of the branches. There is usually not enough room on a family tree to display supporting documentation, but be sure to include it in your files for future reference. A unique idea is to create an interactive family tree on your personal website with an audio or oral history by members of your family, perhaps in a link beside their photograph, to preserve their voice and personal stories for posterity.